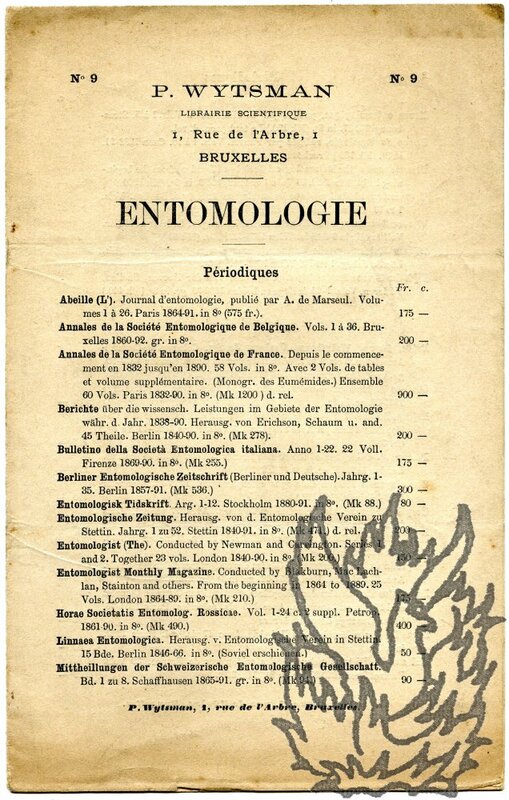 [ Cyril Leslie Collenette, entomologist. ] Typed Letter Signed ('C. L. Collenette') as joint secretary of the Scientific Expeditionary Research Association, to Prof. C. G. Seligman, discussing Council business, with pencil notes by Seligman. On letterhead of the Scientific Expeditionary Research Association, 50 Pall Mall, London. 1 June 1923. 1p., 4to. In fair condition, on aged paper with wear to extremities. A twenty-three line letter discussing Council business, with the last paragraph reading: 'I have to thank you on behalf of the Council for the notes which you so kindly sent in for use at the last meeting. Mr. Hornell will do a certain amount of ethnological work, but in view of your opinion and that of others on the Council as to the difficulties involved, it is not proposed to appoint anyone else for this branch.' On the reverse of the letter are pencil notes by Seligman, made while reviewing a book. [Dr John M. Crawford, Charles Dury, Professor Herbert S. Osborn, American entomologists.] Thirteen Autograph Cards Signed (ten from Dury, two from Crawford and one from Osborn) to the Coleoptera expert Charles G. Siewers of Newport, Kentucky. All sent from Cincinnati, Ohio. Six of the thirteen dated between 1880 and 1882 (the year of Siewers's death). The others undated. The thirteen cards are all 13 x 7.5cm. All with 'POSTAL CARD' printed on front, and all with Cincinnati postmarks, nine also carrying Newport postmarks. All thirteen addressed to Siewers at Newport. For information on Charles Dury (1847-1901) see his obituary by Annette F. Braun in the Ohio Journal of Science, November 1931, pp.512-514. Braun stresses Dury's wide correspondence, and association with individuals including Alfred Russell Wallace, E. D. Cope, Spencer F. Baird, George Horn, John L. LeConte, Robert Ridgway, Elliott Coues, and his 'companion of many field trips' Professor J. S.
Catalogues 1, 2, 5 and 16 of the 'Bibliothèque Entomologique'. February and September 1883, October 1884 and January 1888. 21, Boulevard Bretonnière, a Beaune (Cote-d'Or)'. All four catalogues are stitched and unbound. All four are 8vo, with nos. 1 and 5 of 32 pp, no. 2 of 64 pp, and no 16 of 40 pp. 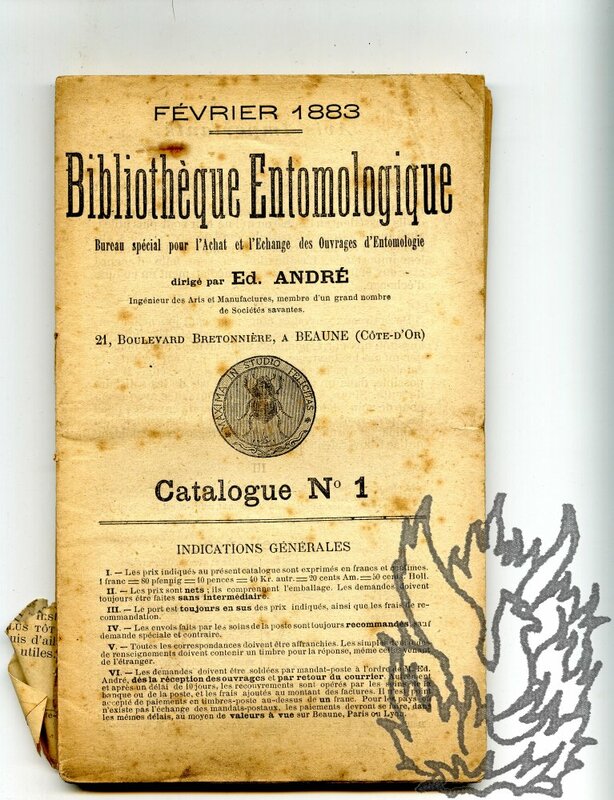 The last leaf of catalogue 2, carrying advertisements is torn with some loss, otherwise the texts are clear and complete, on aged and spotted paper. Providing valuable bibliographical information, in a specialised scientific field. Wytsman's catalogue no. 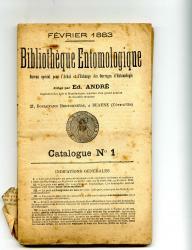 9, in French, titled 'Entomologie'. P. Wytsman, Librarie Scientifique, 1, Rue de l'Arbre, Bruxelles. 8vo, 8 pp. Unbound. An unopened leaf, folded twice to make four leaves. Text clear and complete. On aged and worn paper. Autograph postcard signed to H. Tuckwell. 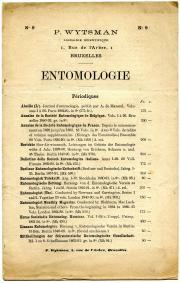 Entomologist and palaeographer (1805-1903). As follows: "Mrs Doncaster 36 Strand London, W.C. near Charing Cross sells Insect Pins [?] & all other apparatus of the like character, as well as British & foreign Insects, Caterpillars, Eggs, &c."